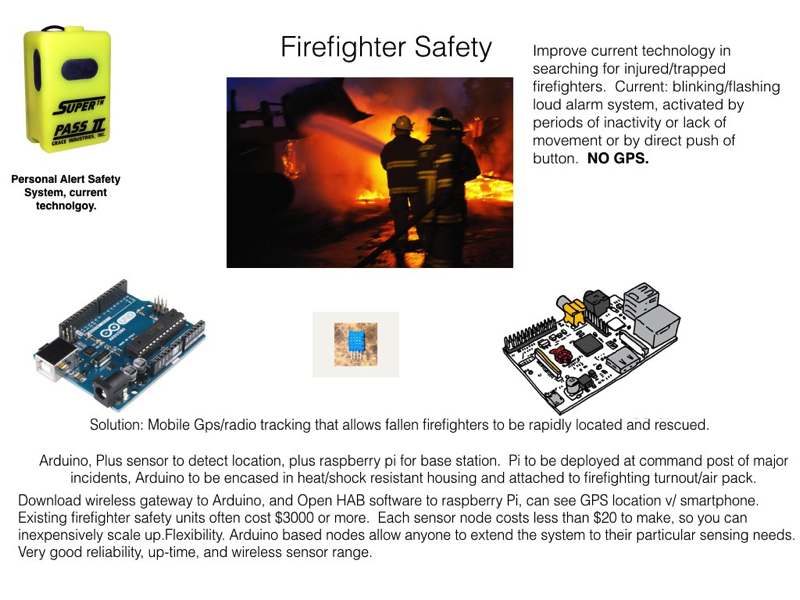 Improving Firefighter Safety with Raspberry Pi and Arduino #piday #raspberrypi @Raspberry_Pi « Adafruit Industries – Makers, hackers, artists, designers and engineers! Improve current technology in searching for injured/trapped firefighters. Current: blinking/flashing light & loud alarm system, activated by periods of inactivity/lack of movement & by direct push of button. NO GPS. Solution: Mobile Gps/radio tracking that allows fallen firefighters to be rapidly located and rescued. **Arduino, Plus gps/radio sensor to detect location, plus raspberry pi for base station. Pi to be deployed at command post of major incidents, Arduino to be encased in heat/shock resistant housing and attached to firefighting turnout/air pack. Location trackable via cell phone.